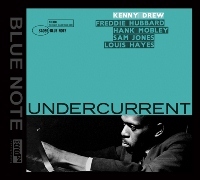 Kenny Drew was an underrated master of bebop. A brilliant pianist who started with the example of Bud Powell and then developed his own sound within the style, in the '50s Drew worked with the likes of Coleman Hawkins, Lester Young, Charlie Parker, Buddy DeFranco, Dinah Washington and Art Blakey. By 1960 when he recorded Undercurrent, Drew had already led ten albums of his own, mostly with duos and trios. Oddly enough he only had the opportunity to lead two albums in his life for Blue Note, an early effort from 1953 and the classic Undercurrent. Matched in a quintet with the young firebrand trumpeter Freddie Hubbard and the always-stimulating tenor-saxophonist Hank Mobley, the 32-year old pianist was ready to truly make his mark. All six compositions are his, and in his accompaniment of the passionate horn men and in his soulful solos, Drew shows that he was one of the major hard bop stylists. He would not make another album as a leader until 1973, nine years after he permanently moved to Europe, but Kenny Drew?? ?s playing on Undercurrent, a superb and very well-recorded Blue Note album that is arguably his finest work, is timeless. Originally released in 1960. The 24-bit super analog extended resolution compact disc (XRCD24) from JVC brings the listener higher fidelity and improved audio quality by enhancing the process of mastering and manufacturing compact discs. The XRCD24 is compatible with all CD players.